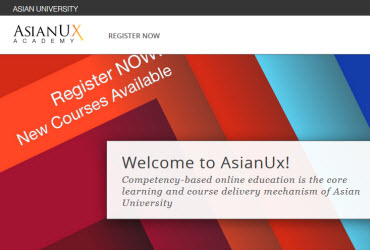 23 February 2015 marked a significant milestone for Thailand’s Open Education when AsianUx Academy — Thailand’s first MOOC Website that offers a variety of high quality Massive Open Online Courses (MOOCs) – has officially launched. All courses are designed, taught and developed by Asian University. We offer many free and open-access online courses to lifelong learners worldwide. In addition, to encourage collaborative and social learning, interactive discussion forums as well as virtual classrooms via videoconferencing are provided.